10+ Most Brilliant Tech Hacks You Need To Know Right Now | Do You Know? Love them or hate them, life hacks have become so engrained in our online lives that there are sites and videos dedicated to sharing these hacks (or debunking them). LEGO mini-figs are perfectly shaped to hold your Apple lightning cords and other cables. 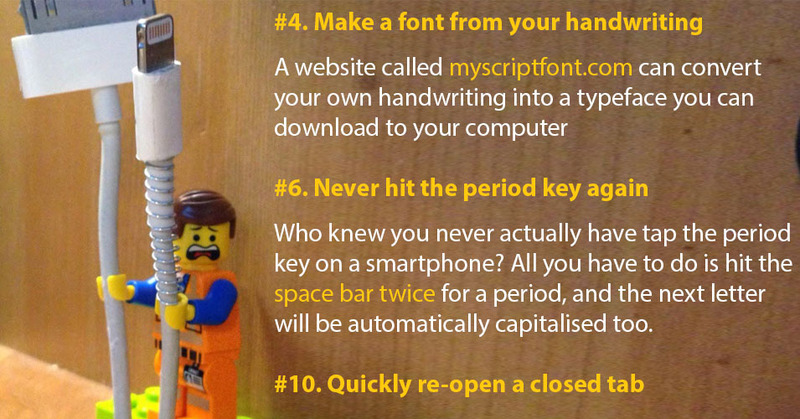 Just stick a LEGO brick on your work desk, then attach a mini-fig, and run your cords through its hands. Yeah, you can thank us later. You can download any YouTube video just by typing "ss" before the "youtube" part of a video's URL link in your address bar. Searching YouTube has never been easier than it is with this trick: when using the Google Chrome browser, you can type YouTube.com into your address bar, then hit tab, and search YouTube directly from your address bar. Gone are the days of actually going to YouTube to find something. This one is for the font junkies out there... A website called Myscriptfont.com can convert your own handwriting into a typeface you can download to your computer and universally use. There are actually several different ways to convert your handwriting into font, but we think this one is among the easiest. Privacy tips are always worth a mention, especially when it comes to Facebook, considering everyone and their mother uses the social network. Have you ever checked Facebook on a strange device and then realised you forgot to log out? Never fear - you can log out still, remotely. Go to the “settings” drop-down menu on your Facebook, then select “security”, and navigate to “when you’re logged in”. From there, you can see all open sessions and and close any of them. Who knew you never actually have tap the period key on a smartphone? All you have to do is hit the space bar twice for a period, and the next letter will be automatically capitalised too. This trick might be well-known, but we thought it was still worth including: Use the space bar to scroll down on any webpage. You can even hold the shift key and the space bar at the same time to scroll up. Macs have a handy shortcut that'll let you look up word definitions in a split second. To look up a definition, highlight any word you see, then press command+control+D, and a dialog box with the info will appear. This is that hack we mentioned earlier for preventing your Apple charging cables and other cords from fraying: Grab the spring out of a ballpoint pen, then stretch it and wrap it around the part of the cord that tends to bend, and it'll keep it straight forever, thus stopping it from wearing down over years. If you just accidently closed out of an important tab in your browser, you can easily re-open it by pressing command+shift+t on a Mac or control+shift+t on Windows PC. Whenever you need to study for an important exam in college or high school, just google “site:edu [subject] exam”, and then you’ll get links to tonnes of sample exams with solutions and everything. We've all seen dropped iPhones on the street or in a store. But did you know there is an easy way to discover who owns it? If you find a locked iPhone and Siri is still enabled, just ask Siri: “Who do you belong to?” You'll then see the owner’s name and contact information. Now go be a good samaritan. Google offers an Android device manager that lets you find a lost or stolen device, but you can also Google “find my phone” to locate your Android device. Just remember you must be logged into the Google account associated with your Android. Want to check whether a username is taken or available on popular sites? Just use Namechk.com. It even checks domain names. Those of you who are super efficient would probably like to know how long it'll take you to get through a specific book before you sit down to start reading it. Well, a website called HowLongToReadThis.com actually estimates time required to read any book. And it's very accurate, in our tests anyway. The health freaks out there will certainly love this trick: Google search “[food] vs [food]” to compare nutritional values between any two foods. We tried it with orange vs apple, for instance, and got this. When visiting a login page of any website, you can view masked passwords with a simple hack. Just right-click the password box, and then select "Inspect Element" to bring up the developer console. Find the line that starts with "input type=password", then change the word "password" to "text", and you will see your password. This is handy hack should you think you're accidentally typing in a password wrong several times and want to check how you're typing it in the password field. To proof read a long essay, paste your article in Google Translate and listen to it. This makes it easier to pick up mistakes, and the tool itself can help you pick up minor typos. 21. To quickly change the case (upper vs. lower) of text in Microsoft Word, highlight the phrase, then hit Shift + F3. Changes cycle through all lowercase, first letter capitalized, and all in uppercase. 22. Run your writing or document past PolishMyWriting.com to clear typos, grammar mistakes and get help with writing styles. 23. If you save your Powerpoint presentation in .PPS instead of .PPT, your file goes into slideshow mode when you open it. 24. Someone needs to use your iPhone to make a call? Use Siri from the lock screen to make the call. The person has no access to any other app on your phone this way. 25. Your best search mate for college assignments is not google.com. Use scholar.google.com instead. Try adding “PDF” to find downloadable copies. 26. Want to play Tetris on Mac? On Terminal, type Emacs then press Enter. Press Esc + X, type tetris and Enter. Use the arrow keys to move and rotate your Tetris blocks. 27. The Bohemian Rhapsody is the perfect music piece to test headphones and speakers to because of the range of highs and lows. 28. Have an old cassette case lying around? Don’t chuck it out, use it as a holder or stand for your mobile phone. 29. If you need to remember the time for something, make a miss call to any number to get a (very precise) timestamp. 30. The easiest way to crank up your smartphone’s speaker volume is using an empty cup. 31. Have a lot of tabs open on Chrome? Use Cmd + 1, 2, 3 to go to specific tabs based on their position, or use Cmd + Tab to just cycle through the tabs. 32. Tap on K to pause a Youtube video, no matter where you click last in the same page. 33. Don’t want your searches on Google to be location-based? Then go to google.com/ncr. NCR stands for “no country redirect”. 34. Many tech companies have a status page that lets you know of their services are down. For instance, here are the links to go to for the status pages for Apple and Facebook. 35. To make sure someone isn’t giving you a fake number, read the number back to them incorrectly and see if they correct you. If they do correct you, then it’s the right number. 36. Stumped by a math problem? Get the PhotoMath app and scan the math problem with your phone and the app will solve it for you. 37. For quick dictionary meanings, google “define: [your search term]”. 38. Use has:attachment in Gmail search to list all emails that have attachments. 39. To get the time and weather of a city, just google “[location] time” or “[location] weather”. Example “LA time” or “LA Weather“. 40. You can take a snapshot of video you are watching via VLC Media Player. Hit Shift + S on Windows, or Cmd + Alt + S on OS X.